“Creationism” is not at all the same as The Path of Continuing Creation. “Creationists” (advocates of “Intelligent-Design”) are definitely not the same as people who follow the Path of Continuing Creation. In fact, these two groups are opposed on the question of “creation.” “Creationists” think that God created all the creatures in one fell swoop. Followers of Continuing Creation, on the other hand, clearly understand that all Earth’s creatures are the products of millions of years of Evolution. The Process of Continuing Creation only accomplishes deliberate design and planned construction on Earth through the agency of Humans (and, to a lesser extent, through certain other conscious animal species). Advocates of Intelligent-Design have been heatedly arguing against the science of biological evolution ever since Charles Darwin published The Origin of Species in 1859. Naturalists, biologists, paleontologists, geneticists and scientists in general have been equally vociferous in refuting the Creationist arguments. The Blind Watchmaker: Why the Evidence of Evolution Reveals a Universe Without Design, by evolutionary biologist Richard Dawkins of Oxford University, 1986, W.W. Norton & Co.
“Fifteen  Answers to Creationist Nonsense,” by John Rennie (the seventh Editor-in-Chief of) Scientific American, July 2002, pp 78-85. Available in libraries, and from Scientific American for a fee. The Online Index to Creationist Claims, edited by Mark Isaak, Copyright 2005, last updated 2006. The Online Index is part of the TalkOrigins Archive: Exploring the Creation/Evolution Controversy. Online at http://www.talkorigins.org/indexcc/list.html. “Top 10 Myths About Evolution (And How We Know It Really Happened),” written and published by Skeptics Society, 2010. This article is downloadable as a free PDF document, at the Skeptics Society website: skeptic.com; www.skeptic.com/downloads/top-10-evolution-myths.pdf. Publications #1, #2, and #4 are all entertaining and very well-written, and the Way of Continuing Creation recommends them to general readers. Publication #3, equally well-written, is an excellent tool for research. Like sources #2 and #4, our Essay here also presents a list of responses to false intelligent-design assertions. Our list draws on the above four sources and others, taking care to give credit to authors at every turn. We have three aims: a) to integrate the evidence from our sources, b) to shorten their explanations where possible, and c) to include some more recent scientific findings. The Practice of Continuing Creation says — Since we know that humans can’t create complex things in a single step, it is curious why we would want to imagine that a divine being, God, would create natural things – bees and leaves — in a single step. Wouldn’t it be more reasonable to say that God created initial conditions, natural laws, and natural processes which created bees and leaves? Elsewhere in the Book of G>O>D> we have said that it is impossible to prove that a super-being, God, did not somehow create the universe. But if God did do that, He or She did it by setting the initial of physics and supplying the initial impetus of creation. After that, the systems have proceeded on “autopilot,” following the laws of physics, chemistry, complexity, probability, and evolution. We Respond: Evolution does not operate by chance alone. Gene mutations happen by chance, but whether or not a mutation survives depends on whether or not it is “selected” by the organism’s environment. And the environment is very rational about which mutated organisms it allows to survive, to reproduce, and to pass that mutation on to subsequent generations. We Respond: In fact, there are lots of intermediate fossils. Archaeopteryx, for example, is one of the earliest known fossil birds with a reptilian skeleton and feathers. There is now evidence that some dinosaurs had hair and feathers. Fossil seashells trace the evolution of various mollusks through millions of years. extinct species that humans are not descended from but who share an ape-like ancestor with us. 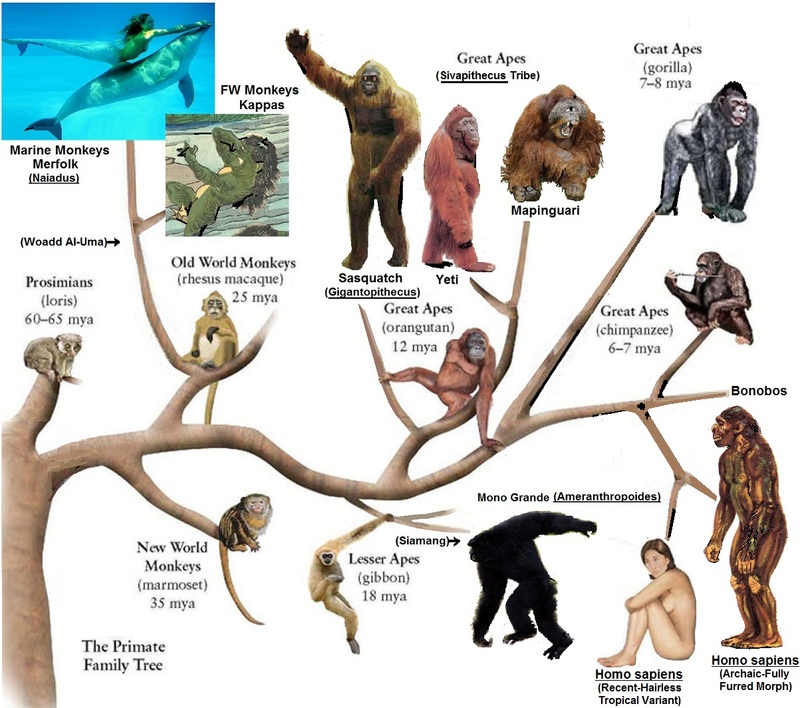 (Amended Primate Family Tree, Frontiers of Zoology. March, 2012. 3cefc8408cb375b63ef1427672e3fe1e–human-evolution-tree-human-evolution-timeline. “Perhaps 20 or more hominids (not all of them our ancestors) fill the gap between our fossil of Lucy the Australopithecine and modern humans.” (Skeptics Society, “Top 10 Myths,” #4 above.) New discoveries continue to be made almost every year, and the most significant developments are usually documented in the pages of Scientific American Magazine. We Respond: Amazingly, this Creationist argument is the exact opposite of their prior argument! But we’ll answer it anyway. Note: The levels of the Taxonomic Tree are named (from top-largest down to bottom-smallest): Life, Domain, Kingdom, Phylum, Class, Order, Family, Genus, Species. However, there are aspects of taxonomy that are still under dispute. (see Wikipedia article on Kingdom, biology.) Humans are in the Phylum Chordate, along with fish, birds, mammals, amphibians, reptiles, and others — because we all have spinal cords. The history of bicycle technology is a good example of the steps of a major new “speciation.” It describes stages of change that are generally the same for both a new species and a major new man-made invention. First, humans discovered we could place a fixed frame over and around a moving wheel. We humans then discovered that we have enough balance to sit on the frame, and we are delighted to find that our contraption actually gains stability as it moves faster! When bicycles first went into production there was an explosion of all different kinds of bikes – huge and tiny wheels; tall and short frames. Many of them were fairly ridiculous. In this stage the bike was exploring its competitive landscape, trying out new niches to occupy. Next, the bicycle mated with the industrial technology of a big gear using a chain to turn a smaller rear gear. This technology did away with the clumsy structure of having a huge bike wheel in front and a tiny bike wheel in the back. So far, then, usage and competition have pushed bicycle design to settle down on the most useful and practical version — equal-sized wheels, spokes, gears connected by a chain. We now had standardization of design, high production (“population growth,”) and declining cost. For a long while after that, the only changes were refinements – making the bike incrementally better and better: lighter weight, better brakes, shift-able gears. After a while, bicycle variations “evolved,” giving us specialized bikes for specialized environments: street bikes, velodrome racing bikes, and mountain bikes. Also, two existing disparate inventions merged to create a new “creature:” The bicycle and the gasoline motor enter into a symbiotic relationship (or perhaps “breed”) to generate an offspring called the motorcycle. What Gave Rise to the Cambrian Explosion? The marked rise in the amount of oxygen on Earth stimulated the evolution of lungs and gills to handle it more fully. And/or maybe the rise in calcium content of seawater permitted the evolution of protective shells. Whatever triggered the early Cambrian diversification opened up an exceptionally wide range of previously unavailable ecological niches. When these were all occupied, limited space existed for such wide-ranging diversifications to occur again. And so, the Cambrian Explosion ended. We Respond: First, the word “theory” has a much, much stronger meaning in science than it does in ordinary language. scientific theories are grounded in testable hypotheses and explain a large and diverse body of facts about the world. Einstein’s theory of relativity has been proven again and again over the decades but it is still referred to as the theory of rRelativity. The Weave of Continuing Creation says that The Theory of Relativity should really be named The Principles of Relativity, and The Theory of Evolution should really be named The Principles of Evolution. No single fossil proves the path of a creature’s descendance. The fossil record proves evolution because the fossils of the earliest and most primitive creatures are in the oldest geologic strata, with younger and younger strata containing increasingly complex plants and animals. If you can find fossil mammals (which are geologically young) in the same geological strata as trilobites (which are geologically ancient), then evolution would be falsified. No one has ever found such contradictory data. Since the time of Darwin, scientists have understood that the early embryos of very different animals look remarkably the same when inside the mother’s egg or womb. Since an early embryo of a human looks so much like an early embryo of a snake, the implication was that humans somehow developed “out of” more pre-historic animals. Today, the study of embryo development and its relationship to evolution is called Evolutionary Developmental Biology, or “Evo-Devo” for short. Since the mid-1970’s, much has been discovered in this field. 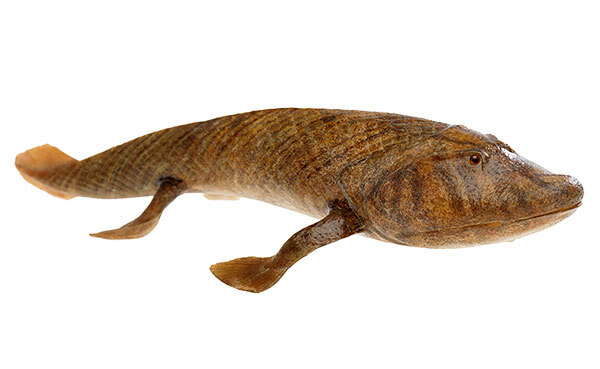 It turns out that every animal has a “toolkit of evo-devo genes,” and that these toolkits are remarkably similar among all animals, from the oldest pre-fish to us recently-evolved humans. All these toolkits include very ancient genes called names like “Hox genes” and “Pax-6 genes.” These genes have been around as far back as the first single-celled animals. (e.g., the amoeba). Today, we know that evolution can also result from changes in the chemical structures that assist in a gene’s expression. The new science of Epigenetics (“on-top-of-genetics”) studies how factors in the development of a creature, including factors in its external environment, can cause modifications in where, when, and for how long a “tool-kit gene” is expressed. Epigenetic changes modify the activation of certain genes, but not the genetic code sequence of the gene’s actual DNA. This can happen when the microstructure DNA or its associated chromatin proteins are be modified, causing activation or silencing. This mechanism enables differentiated cells in a multicellular organism to express only the genes that are necessary for their own particular activity. 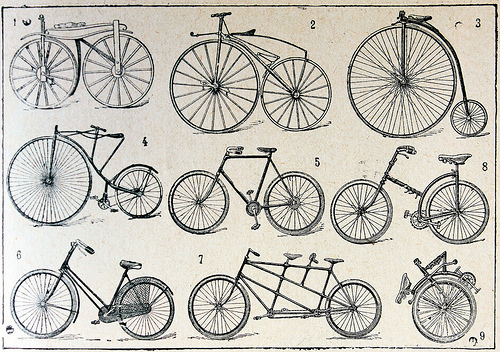 See our example of the stages in the invention of the bicycle, discussed above in our Section of the Cambrian Explosion. We Respond: Evolution does not teach that humans descended from apes; it states that both have a common ancestor that was neither ape nor human, and which lived millions of years ago. When a group of creatures becomes isolated from its main population, it begins to evolve on its own. If that evolution goes on long enough, its descendants can become a new species, unable to mate with any of the creatures from the old parent species. 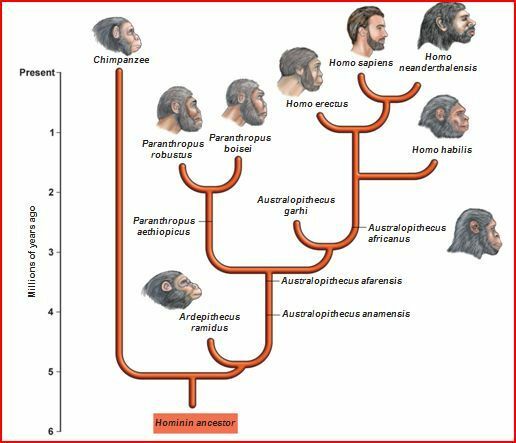 The best way to grasp the pattern of “apes-and-humans” evolution is to take a close look at a drawing of the Human (Homo Sapiens) Family Tree. A number of charts are available online. Periodically, Scientific American Magazine will publish an updated chart of the Evolution of Homo Sapiens Family Tree. In 2003, Scientific American devoted an entire Special Issue to “New Look at Human Evolution,” which contained a number of related charts, graphs, and tables. (available at www.sciam.com). We Respond: No, this is not at all true. Morality itself is a product of evolution, and that evolution started way before Moses climbed up Mount Sinai; even before pre-humans walked the Earth. Morality is not “given by God,” but has instead evolved over time by the Processes of G>O>D>. The Book of G>O>D> devotes entire Essays to THE EVOLUTION OF COOPERATION and THE BIOLOGICAL EVOLUTION OF MORALITY. Here, let us just remark that even wolves, who live and hunt in packs, have a morality. Through instinct and/or learning, they understand that needless murdering of other wolves in the pack is wrong, and failure to share food is wrong, because those behaviors lower the survival efficiency of the pack as a whole. Wolf morality is reinforced and policed by the alpha-wolves of the pack. Even honeybees, who operate entirely by instinct, know not to murder other healthy productive honeybees in the hive. We respond: In Physics, The Second Law of Thermodynamics says that all systems – including all living things – eventually run out of energy, wind down, and collapse into disorder. In science, disorder is called “entropy,” and “maximum entropy” means complete and total disorder. However, the Second Law applies to closed, isolated systems. Those are systems that are not continually receiving new energy from the outside. When their energy runs out, such systems die. For example, if a pocket watch stops periodically receiving new energy by having someone wind its mainspring, the watch stops. Over enough time, the watch will also rust and fall apart. You can delay the rust by sealing the watch in a concrete bunker, but over eons of time both the bunker and the watch will inevitably decay into the soil of the Earth. Hopefully, when our Sun does die out, billions of years from now, we humans will have colonized other solar systems whose suns have long remaining lives. Nick Lane, The Vital Question: Energy, Evolution, and the Origins of Complex Life, 2015, W.W. Norton, pp. 34-52. Nick Lane, The Vital Question: Energy, Evolution, and the Origins of Complex Life, 2015, W.W. Norton, p. 36. Michael Shermer, “The Fossil Fallacy: Creationists’ Demand for Fossils that Represent ‘Missing Links’ Reveals a Deep Misunderstanding of Science,” Scientific American, March, 2005, pg. 32. Leslie Pray, “Antibiotic Resistance, Mutation Rates and MRSA,” 2008, Nature Education 1(1):30. A.C. Maloof, S.M. Porter, et. al., “The Earliest Cambrian Record of Animals and Ocean Geochemical Change, 2010, Geological Society of America Bulletin. 201. 122 (11–12): 1731–1774. Bibcode:2010GSAB..122.1731M. doi:10.1130/B30346.1. Also, New Timeline for Appearances of Skeletal Animals in Fossil Record Developed by UCSB Researchers, 2010, The Regents of the University of California. A. Zhuravlev and R. Riding, The Ecology of the Cambrian Radiation, 2000. Columbia University Press, ISBN 978-0-231-10613-9. R. Cowen, History of Life, 2002, Blackwell Science. ISBN 1-4051-1756-7. Stuart Kauffman, At Home in the Universe: The Search for the Laws of Self-Organization and Complexity, 1995, Oxford University Press, p. 14. J.Y. Chen, and P. Oliveri et.al, n, E.; Bottjer, D.J.. “Response to Comment on ‘Small Bilaterian Fossils from 40 to 55 Million Years Before the Cambrian,’” 2004, Science, 306 (5700): 1291. doi:10.1126/science.1102328. C.R. Marshall, C.R. (2006). “Explaining the Cambrian ‘Explosion’ of Animals,” 2006, Annual Review of Earth and Planetary Sciences. (abstract). 34: 355–384. Bibcode:2006AREPS..34..355M. doi:10.1146/annurev.earth.33.031504.103001.4. David R. Montgomery, Even Setting Evolution Aside, Basic Geology Disproves Creationism, published online in The Conversation: Academic Rigor, journalistic flair. April 28, 2015. Sean B. Carroll, “Evo-Devo and an Expanding Evolutionary Synthesis: A Genetic Theory of Morphological Evolution,” 2008, Cell. 134 (1): 25–36. PMID 18614008. doi:10.1016/j.cell.2008.06.030. Also, S. B. Carroll, “The Origins of Form,” Natural History, Retrieved 9 October 2016. V.l. Chandler, “Paramutation: From Maize to Mice,” Cell, 128 (4): 641–5. PMID 17320501. doi:10.1016/j.cell.2007.02.007. J. Pinkowski, “Neanderthal DNA Lives on in Modern Humans, “Time Magazine, 5-6-2010.